From as close as downtown Lynchburg to as far as Vietnam, Randolph students are applying the skills they learned behind the Red Brick Wall in exciting internships across the world this summer. 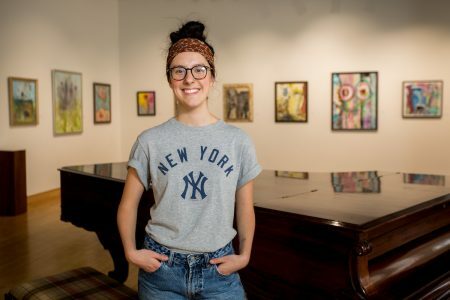 For this post, we asked communication studies major Morgan Yeatts ’20 a few questions about her internship at the Academy Center of the Arts in downtown Lynchburg. What is your title or role in this internship and what kinds of things have you been doing? I am the communications and marketing intern here at the Academy Center of the Arts (ACOA). So far, I’ve written two articles for the ACOA blog, which is attached to the website, and am currently working on a third. The purpose of the articles is to inform donors and people who visit the page of the events that the ACOA has going on—but to convey the information in more of a story form than primarily factual. I also have done smaller tasks, such as inserting the information of Facebook for the ACOA’s ads and delivering brochures. How did you find out about this internship and why were you interested in it? I actually had another internship lined up, but it ended up falling through a week before I was supposed to start. I contacted Maegan Crews, internship coordinator at Randolph College, to let her know what was going on and to ask if she had heard of any last-minute internships that were still available. She replied that the ACOA was still looking for one, so I emailed my resume and a cover letter, went for an interview, and got the job right then! I was interested in this particular internship because Brittany Griffith, director of communications and marketing, was looking for someone who loved writing and storytelling, which are two of the things about which I am most passionate. It seemed like the perfect fit! In what ways did Randolph prepare you? What new skills or information have you learned? This past semester, I took a feature writing class, which has been incredibly helpful in this internship as my primary job is to write features for the blog. It’s been encouraging to see how the class prepared me for this specific job and how I can utilize the skills I learned. What are some of your most memorable moments, and what are some of your biggest takeaways from this experience? I was excited to have the opportunity to write about the theatre summer camp the ACOA has for high schoolers, especially since I participated in the same camp seven years ago. I was able to sit in on rehearsals and interview the director and three of the actors. What are your long-term goals/career plans and how does this internship factor in? Ultimately, I want to find a job writing, whether that be as a feature writer or as a blogger for a company. I’ve always loved the Academy Center of the Arts and all that they do and provide for the community, so it would be incredible if this internship could someday turn into a career there. It’s also helpful that I’m getting the opportunity to write about a lot of different subjects, which will definitely help me hone my skills and style as a feature writer. What’s your favorite thing about Randolph? I chose Randolph College because I liked the small size, and that has proved to be one of my favorite aspects of the school. I love how the professors genuinely care for each student and have the ability to know each one personally because of the size. I love walking around campus and knowing almost everyone’s name. I also love how the environment of the school is geared towards nurturing students to explore not only knowledge and learning, but also themselves. It’s a place where one can be oneself to the utmost and individuality is not merely encouraged, but expected.